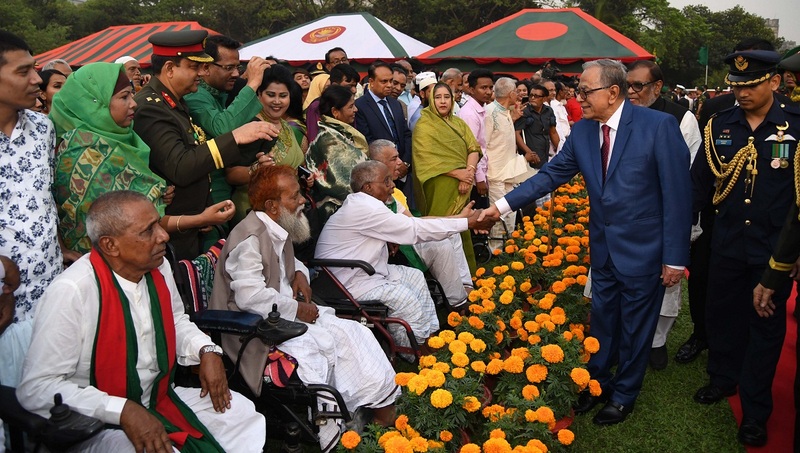 Dhaka, Mar 26 : President Abdul Hamid and his wife Rashida Khanom hosted a reception at Bangabhaban on Tuesday on the occasion of Bangladesh’s 49th Independence and National Day. Prime Minister Sheikh Hasina joined the reception programme held at the lawn of the presidential palace from 4:45pm. President Hamid and Prime Minister Hasina jointly cut a cake on the occasion. They exchanged greetings with war-wounded freedom fighters and family members of Birshreshtha gallantry award recipients and enquired about their wellbeing. The President and the Prime Minister also exchanged greeting with ministers, diplomats and other guests in the VVIP enclosure. Abdul Hamid went round the premises to enquire about the invited guests. Chief Justice Syed Mahmud Hossain, cabinet members, advisers to the Prime Minister, Supreme Court judges, cabinet secretary, senior lawyers, chiefs of the three services, members of parliament, deputy speaker, senior political leaders, editors, journalist leaders, senior civil and military officers, academics, business community leaders, artistes and distinguished citizens also joined the function. Raushon Ershad, senior co-chairperson of Jatiya Party and deputy leader of the opposition in parliament, also participated in the programme. Secretaries to the President and family members of the head of state also took part in the programme. A group of renowned singers, including Subir Nandi, Krishnokoli and Haider Hossain performed patriotic songs while a children troupe rendered chorus performance under the supervision of Shilapakala Academy.